W H Andrews qualified as a veterinarian in London in 1908 and was recruited soon after, in 1909, by Sir Arnold Theiler to join the staff of the newly established veterinary laboratory at Onderstepoort. After initial studies on the treatment of trypanosomosis and on snake venoms he was deployed by Theiler in 1911 to start research on lamsiekte (botulism) at a field station on the farm Kaffraria near Christiana, where he met and married his wife Doris. After a stint as Captain in the SA Veterinary Corps during World War I he succeeded D T Mitchell as head of the Allerton Laboratory in 1918, where he excelled in research on toxic plants, inter alia identifying Matricaria nigellaefolia as the cause of staggers in cattle. When the Faculty of Veterinary Science was established in 1920 he was appointed as the first Professor of Physiology. After the graduation of the first class in 1924, and due to health problems, he returned to the UK, first to the Royal Veterinary College and then to the Weybridge Veterinary Laboratories of which he became Director in 1927. After his retirement in 1947 he returned to South Africa as a guest worker at Onderstepoort where he again became involved in teaching physiology when Prof. Quin unexpectedly died in 1950. Andrews died in Pretoria in 1953 and was buried in the Rebecca Street Cemetery. Keywords: first Professor in Physiology, Onderstepoort Faculty, W H Andrews. After attending the 9th International Veterinary Congress in The Hague in 1909, Sir Arnold Theiler visited the UK to check on the progress of the 1st batch of South African students, P R Viljoen, G de Kock and G F Marais, sent by the government to study veterinary science. During this trip he took the opportunity to recruit 3 promising young British researchers to strengthen the staff of the newly-established 'Veterinary Bacteriological Laboratories of the Transvaal', as it was then called13. In London he selected W H Andrews and D T Mitchell, in Dublin Daniel Kehoe, a promising young serologist who had graduated with distinction. Andrews had also been an outstanding student at the Royal Veterinary College; he received a Class Medal for Physiology in 1905/06 and numerous First Class Certificates of Merit during his studies11. After graduating in 1908 with an MRCVS diploma he was awarded a Jubilee Memorial Bursary and spent a year (1908/09) in Paris studying at the Veterinary School of Alfort and also at the Institut Pasteur, where he studied Microbiology. In August 1909 he returned to London to receive a BSc in Veterinary Science from the University of London, following which he joined the laboratory of Sir John McFadyean in the new Research Institute for Animal Pathology11, 14. By December 1909 he had been appointed Assistant Government Veterinary Bacteriologist in South Africa by Theiler11. There is some uncertainty as to the date of his arrival at Onderstepoort. Gutsche relates a widely-told story that when Theiler fetched Andrews from the Pretoria station in 1910 he utilised the 10 mile drive to Onderstepoort to inform him of his duties, which would take every hour of every day, concluding with 'and in your spare time you will study snake venom'13. While revealing the character of Theiler, the date mentioned in the anecdote seems to be incorrect as a picture postcard annotated by Andrews featuring the 'hostel' or single quarters at Onderstepoort specifically states that he arrived there in December 1909, staying until October 191111. This is consistent with his account as set out in a later job application (which is undated but in which his age is stated as 38, placing it around 1925). 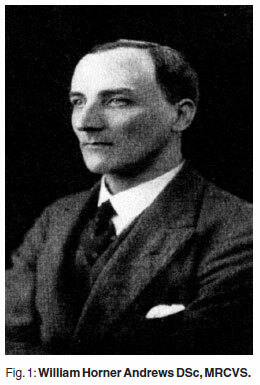 In October 1910 he was elected as an ordinary member of the Royal Society of South Africa, indicating recognition of his scientific standing11. His first task was to complete a study started by Sieber on the treatment of trypanosomosis with 3 newly-available drugs. Two of these were found to be 'useful' in treating T. congolense -type infections in horses, cattle and sheep, although the cattle remained carriers. This work was reported in the 2nd report of the Director of Veterinary Services in 19121. Apparently he did have spare time available as he also reported in the same issue on a series of experiments with snakes, determining their toxicity, the characteristics of their venom, their differential diagnosis and treatment2. This work was also published in the SA Journal of Science in 19133and in more popular form in the Journal of Agriculture in 19236. By 1911 lamsiekte had become the most important animal disease in South Africa, effectively preventing cattle farming in the arid western parts of the country, and Onderstepoort was widely criticised for its inability to find a solution. In reaction Theiler established a field station on a farm called Kaffraria near Christiana in the then western Transvaal and put Andrews in charge, probably in October 1911, when he left Onderstepoort according to the postcard mentioned above. For the next 6 years he conducted feeding experiments there, apparently with little success, although Theiler later acknowledged his contribution to lamsiekte research on 2 occasions. Later in 1911 the farm Armoedsvlakte near Vryburg was offered to Theiler free of charge for a year for experimental purposes and when it was eventually bought by the government in 1916 for establishing a permanent lamsiekte experimental research station, Kaffraria was apparently phased out13. When Theiler left for a year's study leave in Switzerland in September 1912 the rest of his staff remained focused on the disease. Upon his return he brought with him H H Green, a biochemist, who was first introduced to Armoedsvlakte before moving to Onderstepoort for biochemical studies on the disease13. In 1912, following the union of the South African colonies and the Boer republics of the Transvaal and the Orange Free State, he was appointed Veterinary Research Officer in the new Division of Veterinary Research of the Union of South Africa. Of interest from this time is a 5-page handwritten history of the SA veterinary service, entitled 'The Veterinary Profession in South Africa', probably dated 1912. During this period Andrews met and in 1916 married his wife Doris Alice Brinks Burls, who was living at Burlington farm adjoining Kaffraria, near Christiana11. According to a brief biography published in The Veterinary Record in 1927, he joined the South African Veterinary Corps as Captain and Officer-in-Charge of No. 1 Section in 1914, seeing service in German South West Africa and being mentioned in dispatches11. That same year he published a paper on 'Bloed Pens' in lambs4. Among his surviving papers are 2 handwritten reports to the Director of Veterinary Services relating the Veterinary Corps' activities including diseases encountered and treatments administered. The 1st covered the area between Prieska and Upington between October 16 and November 17 in 1914, the 2nd an exercise in the vicinity of Upington, Rouxville and Rooidam from November 18 to December 2, 1915. Confirmation of his military involvement is found in a letter dated 14th May 1923 outlining his discharge from the Pretoria Regiment of the 12th Infantry Battalion and his transfer to the reserve of officers of the Veterinary Corps with the rank of Captain11. Apparently his health subsequently deteriorated and in 1917 broke down with the result that he left for England on 6 months sick leave (later extended to 8 months) in October 191713. In the spring of 1918 Montgomery, who had succeeded Theiler as Director, faced a staff crisis.PRViljoen had left Armoedsvlakte for a position at the Transvaal University College, D Kehoe returned to Ireland, F Veglia had not yet returned from Italy where he performed military duties, G De Kock had decided to study medicine and J Walker had moved to Kenya to replace Montgomery. Walker was replaced in turn by D T Mitchell from Allerton, leaving both Armoedsvlakte and Allerton laboratories leaderless13. When Andrews returned from sick leave he was therefore transferred to Pietermaritzburg in charge of Allerton where he performed his most successful research, including the identification of Matricaria nigellaefolia as the cause of 'staggers' in cattle5and a report on the toxicity of Adenia digitata Burtt-Davy, in collaboration with H H Green12. In 1920/21 he served on the 1st council of the newly established South African Veterinary Medical Association13. 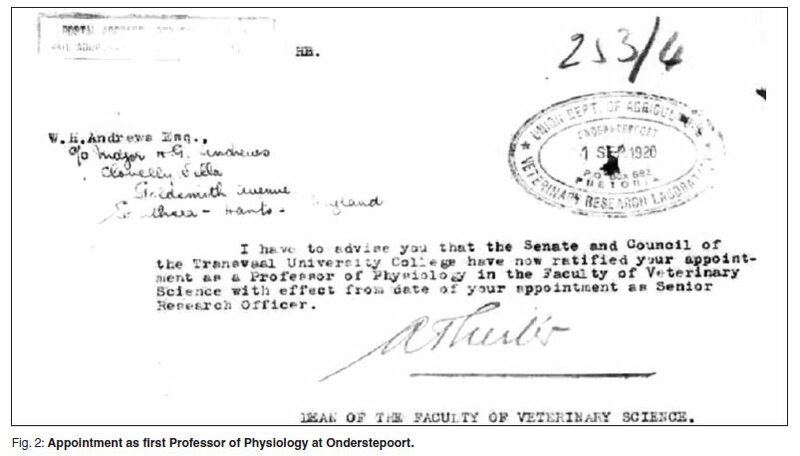 When the establishment of a Veterinary Faculty at Onderstepoort was approved early in 1920, Andrews was nominated as Professor in Physiology by the newly-appointed Dean, Arnold Theiler, although he also remained a Senior Research Officer13. In a letter dated September 1, 1920, he received a note of ratification from Theiler (Fig. 2). As in the case of Theiler and the other appointees he was awarded a year's study leave abroad to prepare himself for his new duties. He studied advanced Physiology at the University of London and in 1921, according to a surviving letter from its registrar, had a DSc in Science conferred upon him11. In 1922 the first students arrived at Onderstepoort for the final 3 years of their study. Unfortunately, because of continued health problems, it was also the only class that he would guide until their graduation in 1924. In May of that year the Secretary of Agriculture approved his resignation on ill health grounds13. In fact he had already received an offer in January 1924 to become Senior Assistant at the Research Institute of the Royal Veterinary College in London. Following his return to the UK he was in addition offered a Clement Stephenson Research Scholarship to enhance his salary at the Royal College11. During this period he published an extensive review of animal diseases in South Africa7. Following the death of the Chief Veterinary Officer in the UK, Sir Stewart Stockman, the duties of that post were split and W H Andrews was appointed as Director of Research and Head of the Weybridge laboratories. His referees were Sir John McFadyean and Sir Arnold Theiler, and he took up his post in 1927. During this period of his career he worked more closely with medical colleagues, lecturing at the Royal Society of Medicine on plant poisoning in 19268and on trypanosomosis in 19279. In 1928 he was appointed as an Examiner for the Membership of the Royal College of Veterinary Surgeons11. In 1929 Andrews was appointed as Director of the Imperial Bureaux of Animal Health at Weybridge and also attended the Pan African Agricultural and Veterinary Congress in Pretoria as United Kingdom representative11, 14. His achievements during the 1930s consisted of building up Weybridge and also establishing the satellite station at Pirbright where, as Director of Weybridge, he was responsible for its research work. This included its activity as the main research arm of the Foot-and-Mouth Disease Research Committee as reported in its 3rd, 4th (1931) and 5th (1935) reports10. During 1931 Andrews encountered serious recruitment problems at both Weybridge and Pirbright and wrote to the Chief Veterinary Officer to highlight the problem, explaining that veterinary workers should be treated differently from agricultural workers in terms of pay and conditions. Despite these difficulties Andrews was successful in expanding facilities at Weybridge. Wings were added to the west and east of the main building, projecting northwards and providing much laboratory space, and additional adjacent farmland of 133 acres was purchased. In his position as Director of Veterinary Research he had to give many lectures on a variety of topics, including 'Vaccination against Bovine Contagious Abortion' and 'The Relation of this Disease to Undulant Fever of Man' at the N.V.M.A. Congress 1932. At the 11th International Veterinary Congress in London he lectured on current thoughts on foot-and-mouth disease11,14. During this period he continued to serve on other eminent bodies. In March 1931 he was selected as a UK representative at the Second International Congress of Comparative Pathology (held in Paris in October 1931), supporting Sir Walter Fletcher, KBE, CB, FRS. By 1932 he served on the Council of the Royal Society of Tropical Medicine and Hygiene and was present at the opening of their new headquarters Manson House by the Prince of Wales in March of that year. Ill health was to trouble him again, apparently triggered by funding difficulties for the laboratories, and he went off sick in October 1937. Nevertheless, during World War II he served as an officer in the Home Guard, rising to the rank of Lieutenant in 'C' Company, 3rd Battalion, First Surrey Home Guard. In 1941 he moved to the Ministry of Agriculture and Fisheries in London to assist with the management of veterinary matters during the war, necessitating his resignation as head of the Imperial Bureaux in Weybridge and as Lieutenant in the Home Guard. Retiring from the Ministry aged 60 in June 194714he returned to South Africa as a guest worker at Onderstepoort, living in Pretoria with his South African wife. A detailed record of his plans and activities is contained in correspondence with his sonWHH Andrews. For example, in late 1947 he was living in the Hellenic Hotel in Pretoria and giving a lecture at 11.10 am at Onderstepoort11. During his final years he spent much time at Onderstepoort, living at the Wonderboom Government Village at Ficus, north of Pretoria, and began further research activity on neuromuscular transmission. When Dr J I Quin, Professor of Physiology at the Faculty of Veterinary Science and newly appointed Director of Onderstepoort, unexpectedly died in service in March 1950, Dr Andrews was fortunately available to take over his teaching duties until a permanent appointment could be made. He died on 17th March 1953 in Pretoria and is buried in the Rebecca Street Cemetery, Pretoria West11.